I can’t be an introvert. Can I? For a long time, I was aware of the word ‘introvert’ and yet believed that there was no way on Earth that I could be one. Because my understanding was completely wrong, that’s why. When it came to being with people and in environments that I was comfortable with, I could be very sociable indeed (still the case). In some on my classes, I was even the class-clown. Susan Cain’s 2012 TED Talk and “Quiet” book resonated with me hard when I came across them in my early 20s. Seriously hard. A lot suddenly started to make sense. I wasn’t weird, I was an introvert. And there were millions of others out there, silently in the wings, who were just like me. I wanted to tell anyone and everyone about my introversion. More than 6 years on since she took to that TED stage, there is now a lot more information and research available on introversion, which is great. However, there continues to be much confusion and misunderstanding. For example, I am frequently told that there’s no way that I can be an introvert, as I apparently “love to talk”. Grr. They are not mutually exclusive, people! This post will aim to clear that up, with the help of some of the most renowned experts on the topic. Or in other words - an introvert is someone who has a preference for periods of alone-time, and indeed they require this down-time to recharge their batteries. Beth also explains how introversion and shyness are not the same thing at all! Studies by psychologist Hans Eysenck show that introverts require less stimulation from the world in order to be awake and alert than extroverts do - i.e. introverts are more easily over-stimulated. If you wanna geek out on more science (we are jedi’s here, after all), you might like this Quiet Rev article, and also this one from IntrovertDear. Okay, so you’re still with me aren’t you? Now I have to warn you, this is where it gets a little less clear-cut. You see, arguably, no one is a total introvert nor a total extrovert, rather somewhere on an introvert-extrovert spectrum (continuum). So technically we are all ambiverts, to some extent. BUT, each of us favours one more than the other, even if we might be towards the middle of the spectrum. I, for example, define myself as a sociable introvert. I’m particularly sociable - in small groups and with folks I am familiar and comfortable with; i.e. very introvert-typical. Basically… I wouldn’t say I am the most introverted person in the world by any means, however I am most certainly an introvert. Pretty much all of the statements Y findings in this article resonate with me. In my early-mid twenties, I working in sales in an open-plan office which was “fun” (aka, challenging). I’m no introvert expert, but I wanted to finish on a more personal note. For me, it has been both enlightening and empowering to discover my being an introvert, and knowing that there was nothing inherently wrong with me and millions of others out there just like me.Pretty much every statement I have read about introversion, I can relate to in one way or another.That said, sometimes I enjoy going to a big party. And I know extroverts who also don’t particularly enjoy small-talk, for example. Who does?! The point I’m trying to make here, is that us human beings are so wonderfully unique and complex and inter-changeable that nothing is absolute. 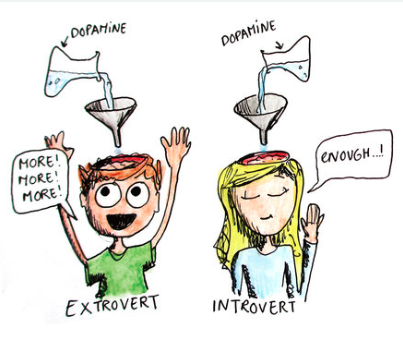 The extent of our introversion (or extroversion) can vary depending on our environment and state of mind. It also fluctuates throughout our life. Any “test” should be taken with a pinch of salt. That said, the introvert/extrovert and MBTI tests are the 2 tests I have come across that I can most relate to, and have found both most useful and most accurate, vs the many other personality tests/groupings I have come across out there. Introverts… beautiful creatures they are. Yoda himself introvert is. Beautiful gifts introvert has, brains be different, bodies be different, internal organ systems be different. The Force different in introverts flows. More slowly. More powerfully. Force in introverts greater is. Introverts their own Force feels strongly. Introverts’ Force best knows. Introverts wise to listen to inner Force, they be. ← 7 reasons why we get stuck in our heads + don't take action.